A chase and shootout involving California Highway Patrol officers and two suspects in Stockton late Tuesday resulted in the arrest of one of two Santa Clara County escaped inmates, according to the CHP. 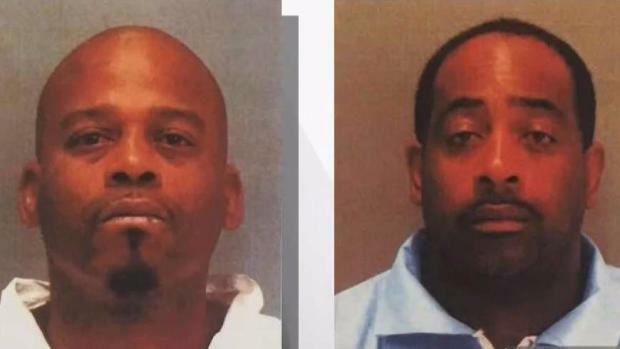 Tramel McClough, 46, was arrested late Tuesday night and is being housed at the San Joaquin County Jail, but the CHP said they are still searching for John Bivins, 47, who along with McClough, escaped from a Santa Clara County courthouse in Palo Alto two weeks ago. Bivins is driving a green 1999 Ford Explorer with the California license plate 7TTY505, the CHP said. A chase and shootout involving California Highway Patrol officers and two suspects in Stockton late Tuesday resulted in one arrest and a search for a man who had been identified as one of two Santa Clara County escaped inmates, according to the CHP. Jean Elle reports. At about 5:15 p.m., CHP units attempted a traffic stop of the vehicle on northbound Interstate 5 south of Eight Mile Road. A short chase ensued onto southbound Trinity Parkway, where McClough exited, ran into a Walmart store and was later apprehended, the CHP said. The passenger, Bivins, fled in the vehicle on southbound Trinity Parkway, where an officer fired shots just south of McAuliffe Road, the CHP said. Bivins continued to flee in the vehicle on northbound Trinity Parkway. Santa Clara County sheriff's investigators tracked the two to Stockton. "As for the specifics of why they were in Stockton, I don't have that information at this time," sheriff's Sgt. Richard Glennon said. "But based on the information they had, it was reliable." Earlier this month, Bivins and McClough, who were being held without bail after robbing a Verizon store, were leaving a courtroom when they made a beeline for the exit, hopped in a getaway car, drove a few blocks and jumped into a van before fleeing the area, according to the Santa Clara County Sheriff's Department. Bivins, 47, is described as being 5 feet, 9 inches tall and 180 pounds, with brown eyes and black hair, the sheriff's office said. "Bivins, he escaped from custody, he evaded CHP, he's in a fleeing vehicle," Glennon said. "There was an officer-involved shooting, so he's dangerous. Definitely a dangerous individual; has a history of acquiring weapons." The sheriff's office did not provide a timetable on when McClough will be brought back to Santa Clara County after his court date in San Joaquin County on Monday. Hear shots fired during CHP pursuit. This happened on Trinity Pkwy in Stockton.